India: NNG and Ayana Navigation Solutions (ANS) have introduced a new personal navigation device (PND) especially designed for Indian roads. 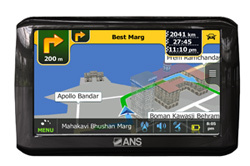 The high-quality and powerful ANS Navigator A-501 device, a 5-inch model, runs on the renowned iGO primo software by NNG, a global leader in the GPS navigation industry. The new PND is pre-loaded with the latest India maps and over 7 million points of interest (POIs). To guarantee continued reliable guidance, the unit comes with a 1-year map update guarantee from NNG’s update portal Naviextras.com. Fitted with the Integrated Quick Search (IQS) feature, iGO primo enables every driver to begin trips with no delay. The IQS offers a search mechanism that allows the driver to program his destination in just a few seconds: once no more than the first 3 letters of the destination is entered, the software starts searching simultaneously across all available databases, including POIs, Favorites, Point Addressing and more. While driving, the Intuitive Navigation feature in iGO primo merges all available resources, such as map and POI data, registered driving speed, and the ability of fast recalculation in a single superior navigation experience. It interprets the user’s behavior and offers fast solutions: in response to reduced driving speed, the software calculates detours, assuming that the driver has run into a sudden traffic jam. When leaving the highway unexpectedly, the system doesn’t just blindly guide the driver back to his original route, but offers petrol stations or restaurants as an alternative.